The order from Judge Richard L. Vorhees states: “On December 2, 2014, Defendant Bernard von Nothaus was sentenced to a three-year term of probation, including six months home confinement. Defendant, now age 70, has successfully completed one year of probation and his six month period of home confinement. According to counsel for Defendant, the U.S. Attorney’s Office has been consulted and does not oppose the instant request. Likewise, the supervising U.S. 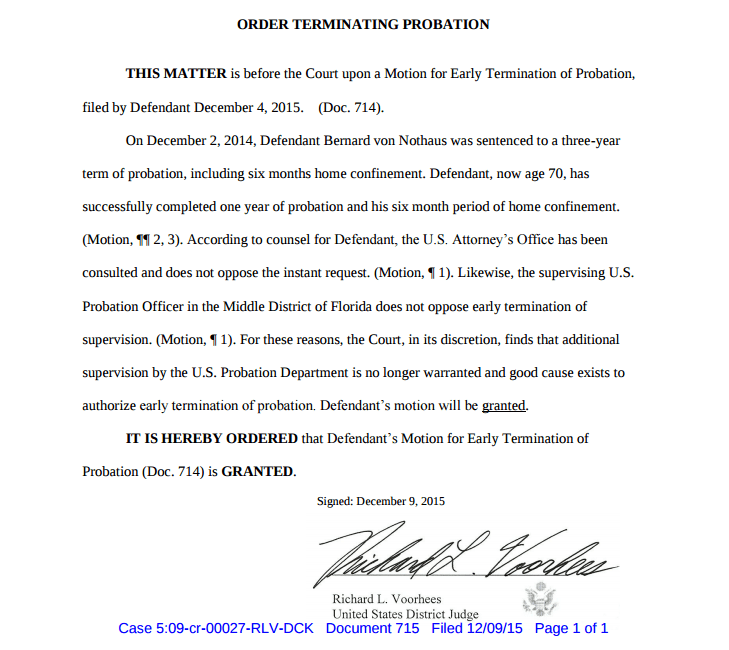 Probation Officer in the Middle District of Florida does not oppose early termination of supervision. For these reasons, the Court, in its discretion, finds that additional supervision by the U.S. Probation Department is no longer warranted and good cause exists to authorize early termination of probation. Defendant’s motion will be granted. The email from von Nothaus added, “I[n] light of the fact that I was facing 22 years in federal prison, the three years of probation is the closest I or the Liberty Dollar will ever come to a vindication. You can stay up to date with Bernard von Nothaus and Liberty Dollar through his email list Liberty dollar News. This case is such a travesty. Nothaus had a bunch of snitches in his employ and he never even suspected. Even after the trial; I asked him; “Why didn’t your lawyer get the name of the ‘informants’? Nothaus replied that he thought there was only one informant, a female whose name I don’t recall. The lesson here is if you are outside the mainstream, especially if you operate a business, you really have to be ‘suspicious’. Sometimes it takes years for the Feds to build a case, and it’s easy for them when the mark is unsuspecting. The domestic surveillance state is SO HUGE today they have DHS employees taking your order at a Dunkin Donuts in the middle of nowheresville. There are more “spies” in the US counter intel ops than there was during the Cold War, and very little is reported even in the alt media. Go to any Starbucks and/or public library for a period of two to three weeks. Get a glance at what they are doing in front of their computer, and you’ll realize that the State is bigger than ever before!